After reading the criticism of her book on cancer cures, including comments from readers on her story in the Daily Beast, Suzanne Somers takes on her detractors, doctor by doctor. As I read the reactionary response to my piece in The Daily Beast, I feel the need to reply only to shed light on the real truths as opposed to the lies, inaccuracies, and distortions of your so-called experts. Let's begin with Dr. Wulf Utian, head of the North American Menopause Society. I am the person who exposed him for the paid pharmaceutical shill that he is a couple of years ago on “Larry King.” As he incompetently tried to persuade the global audience that synthetic horse hormones (Premarin, Provera, and Prempro) were no different from bioidentical natural hormones, I pointed out that according to my research and the dozens of doctors I have interviewed, Dr. Utian is dead wrong and there are mountains of literature refuting his position. I pulled out the Google literature on Dr. Utian proving that he is funded by over 250 different pharmaceutical companies with the largest contributor being Wyeth, which makes (surprise) Premarin, the synthetic (so-called) hormone proven in 2002 by the Women’s Health Initiative to give women cancer and often cause death. It is very clear Dr. Utian is paid well to further his drug agenda. Most of the money raised for the American Cancer Society goes for marketing to raise more money for them to keep Dr. Brawley and others in their cushy offices and lifestyles. I do not sell hormones or any drug. I have NO agenda other than the health, safety, and quality of life for all people. Let's now look at my other attacker, Dr. Otis Brawley, head of the American Cancer Society. Here's the joke...all of the well meaning people who have raised money for this bogus “society” have never been told that most of the money raised for the American Cancer Society goes for marketing to raise more money for them to keep Dr. Brawley and others in the ACS in their cushy offices and lifestyles; they categorize it as “overhead.” So much for the health of the people. 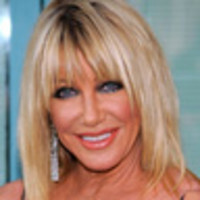 • Gerald Posner: Does Suzanne Somers Cause Cancer? • Suzanne Somers: My War on Cancer Dr. Brawley said, “We are making strides and extending life.” OK Dr. Brawley, billions of dollars... Where's your cure? If this were a military project you'd be fired and drummed out of the field. Extending life? By a couple of months with horrible quality of life? Really, Dr. Brawley? Are you proud of your “success”? Dr. Keith Black. I don't know why he is involved. He is a surgeon. I feel he was threatened by Dr. Burzynski, who was acquitted after being sued by the FDA, and allowed to continue curing and treating cancer patients; this same Dr. Burzynski is in compliance with the FDA and has completed phase II clinical trials and been approved for phase III clinical trials. Although Dr. Black is skilled at removing brain tumors, Dr. Burzynski is having a 60% success rate at curing these virulent tumors without surgery. How many of Dr. Black’s patients are still alive? Dr. Black has to send his post surgery patients into the chemo wards and at that point his success rate is dismal. To read between the lines, Dr. Burzynski is a threat not only to Dr. Black, but also to the cancer industry as a whole. Dr. Burzynski is close to a cure and these paid pharmaceutical shills are going to do everything in their power to keep this information from getting to the public. As the messenger, I am being attacked because they have got to silence the opposition. People...I will say it again...Read between the lines. Connect the dots. The war on cancer has failed. They don't want you to know the big lie. We are the losers to continue trusting in the pharmaceutical model as though our life depends on it. Pharmaceuticals have their place as a last ditch effort. But we have to consider the tipping point. How long can we keep pumping these dangerous chemicals into our bodies and expect to be well? Think about it this way; if someone suggested you swallow a mouthful of rat poison daily to cure your disease, would you do it? I walk my talk...I have our best interests at heart. No one pays me anything. The choice is yours.